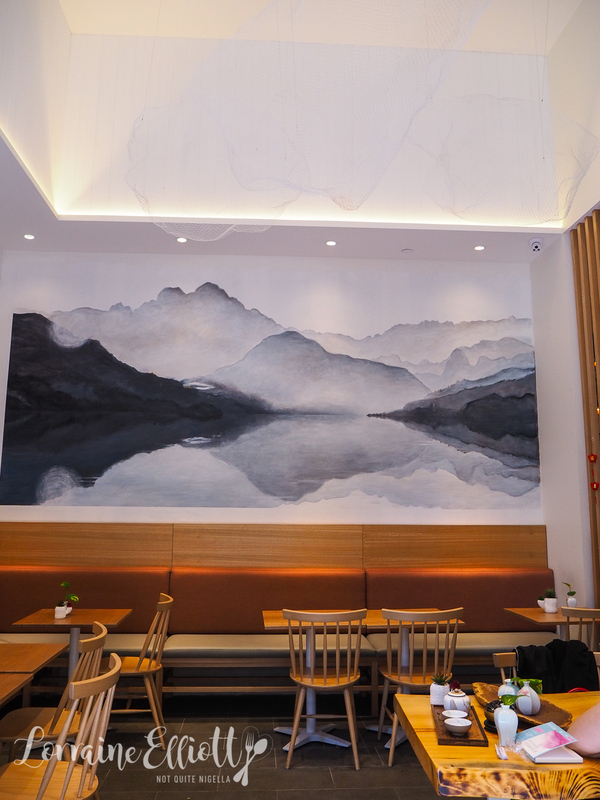 At Tea is a tea house and dumpling restaurant, part of the new Central Park Duo building. 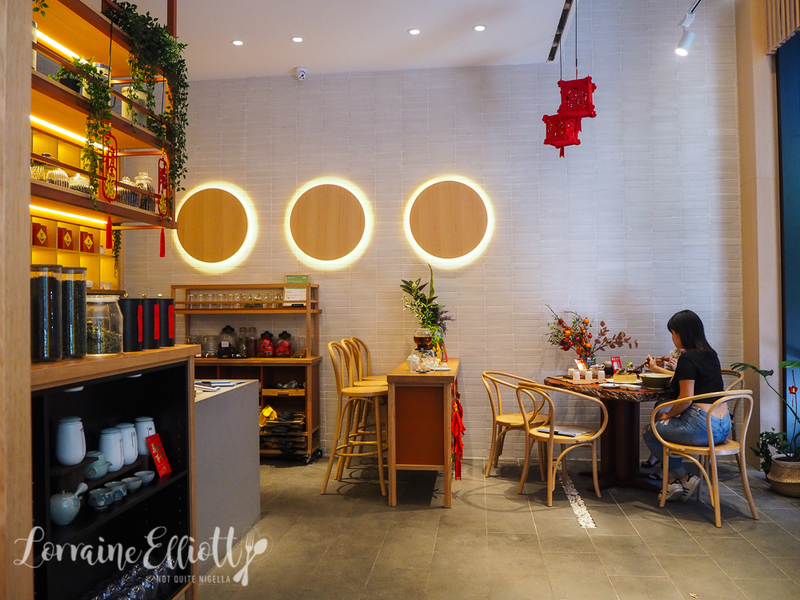 Located adjacent to the main Central Park shopping centre and opposite the Sheraton Four Points it serves up dim sum to order as well as a range of teas in pots or tea based drinks. "OMG where are we? I feel like we need breadcrumbs," I say to Mr NQN as we look around for At Tea. I had just finished an acupuncture appointment and my stomach had rumbled throughout it, protesting at the late lunch time. "Borborygmus," Mr NQN commented. It's his new favourite word and means stomach rumbles. We spot At Tea opposite the Sheraton hotel. There's a smallish outdoor area but it is fully bathed in the sun so we take a seat inside. Service is very deferential and friendly, almost Japanese in tone and nothing is ever too much trouble. 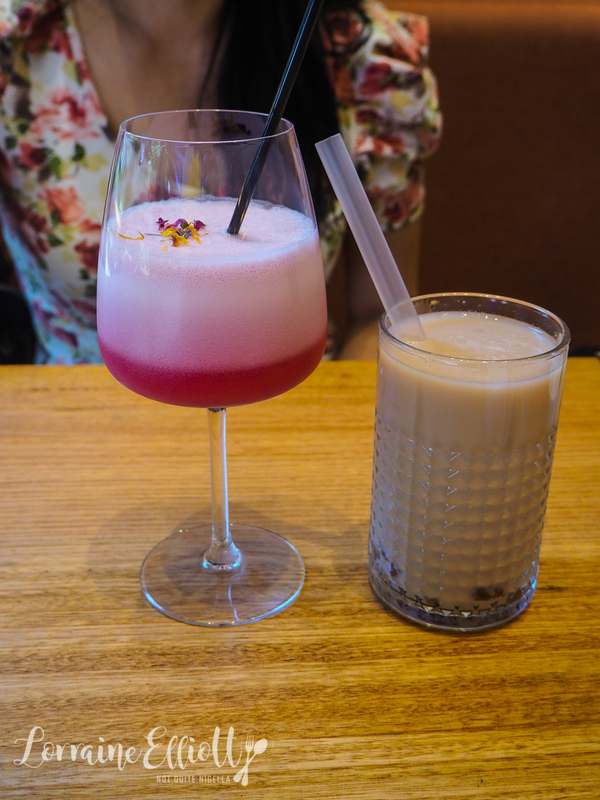 I take a look at the menu-the drinks list differs slightly from the one online and there are fewer choices. We start with a Pu-er bubble tea which can be ordered either hot or cold. Since it is a warm day we opt for cold. It isn't overly milky or sweet. In fact the bubbles are sweeter than the tea. I like the Sydney Sweetheart, a coconut fruit tea that is mildly sweet and pretty. The food is meant for sharing and plates come out separately. 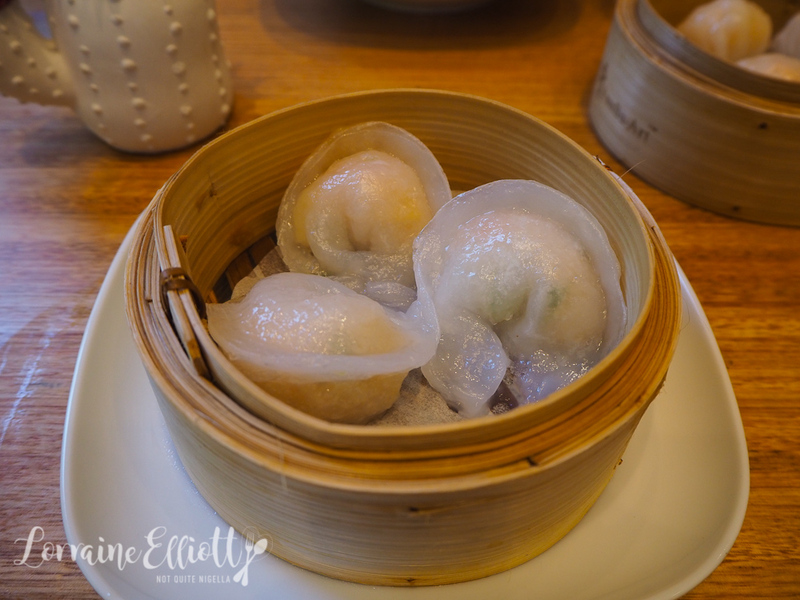 We start with the Xiao Long Bao: six soup filled dumplings with dipping vinegar. We let them cool, pick them up with the chopsticks and place them in a spoon and then nip off the tops with our teeth and sucking out the soup before eating the rest. 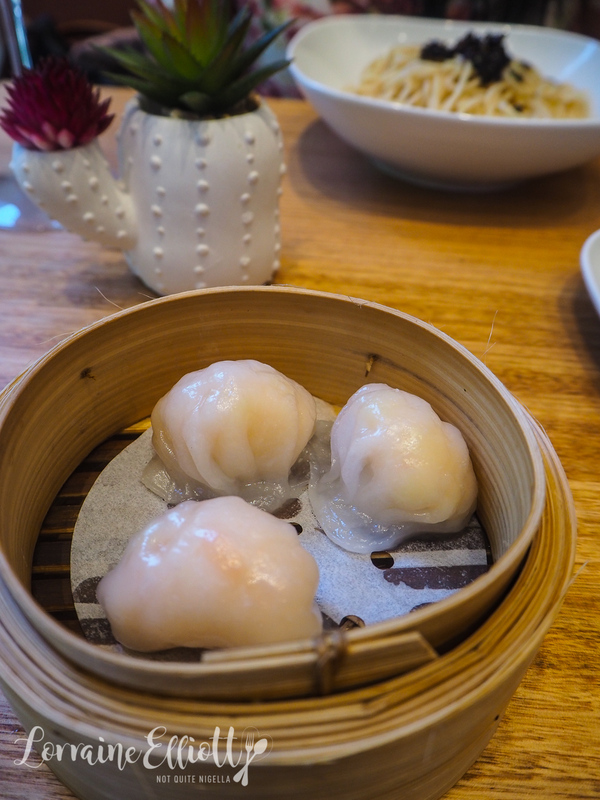 I have to say that while the scallop dumplings are nice, there's no trace at all of XO sauce so I'd just save the $2 and get regular scallop dumplings. The har gows are neat little bundles. 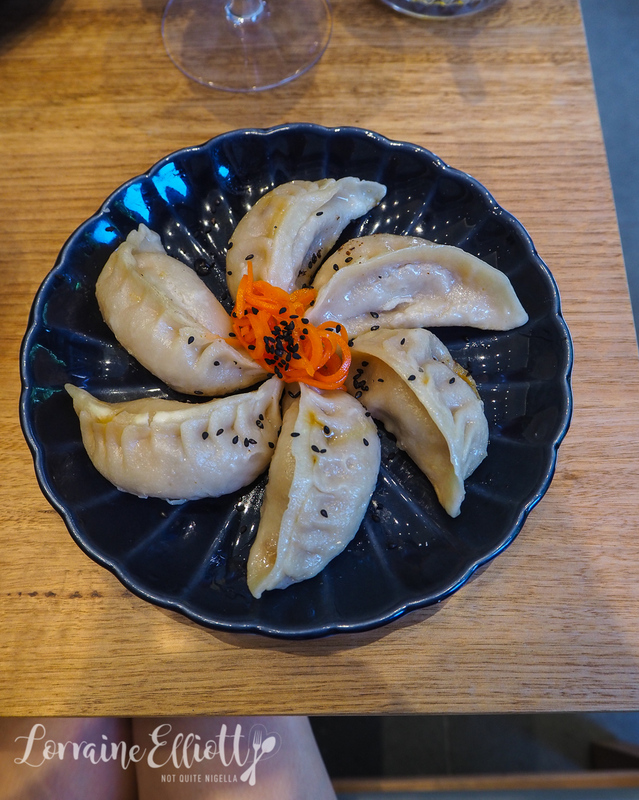 I prefer the prawns in these dumplings to be a little less minced and more bouncy in texture but they're not bad. One of my favourite plates is one of the simplest. The shanghai noodles are pale wheat based noodles in a scallion oil and soy sauce. 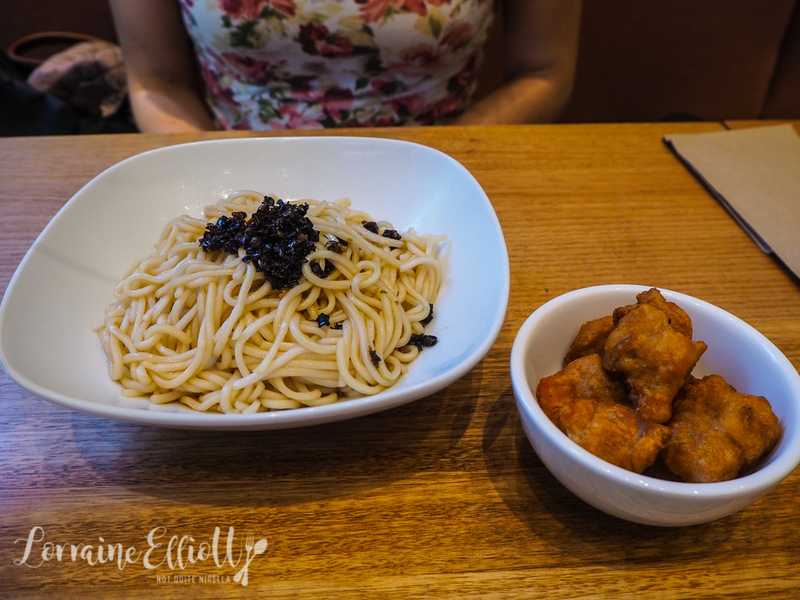 I had these in Shanghai (although the noodles were slightly different) and I love the simplicity of the shallot oil and soy dressing and the caramelised scallions on top. It comes with a small bowl of juicy, deep fried chicken pieces. These were designated as one of their specialties. 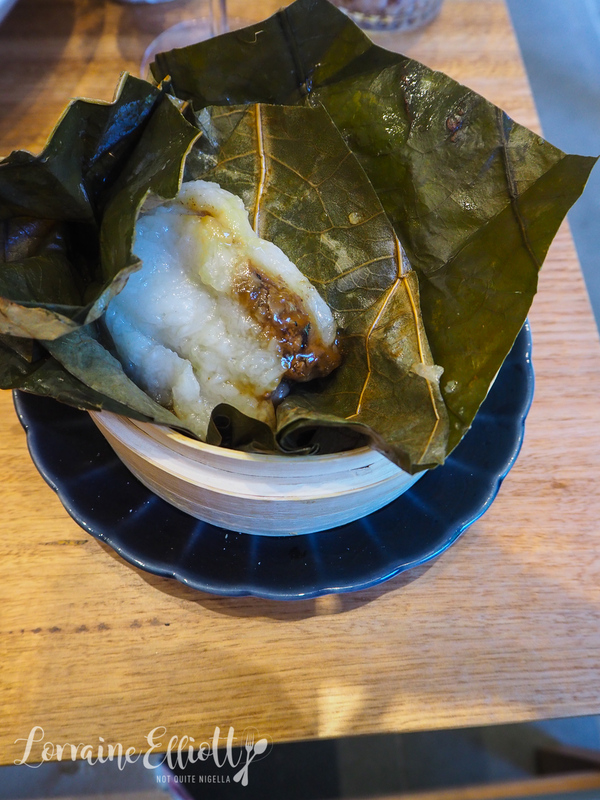 The sticky rice is very soft in texture and is said to be filled with chicken, pork, egg yolk, mushroom and dried shrimp. While the flavour is pleasant, I would have to say that I only spotted a bit of pork and a mushroom. I prefer ones where there's a bit more of the additions and it's not mostly rice. 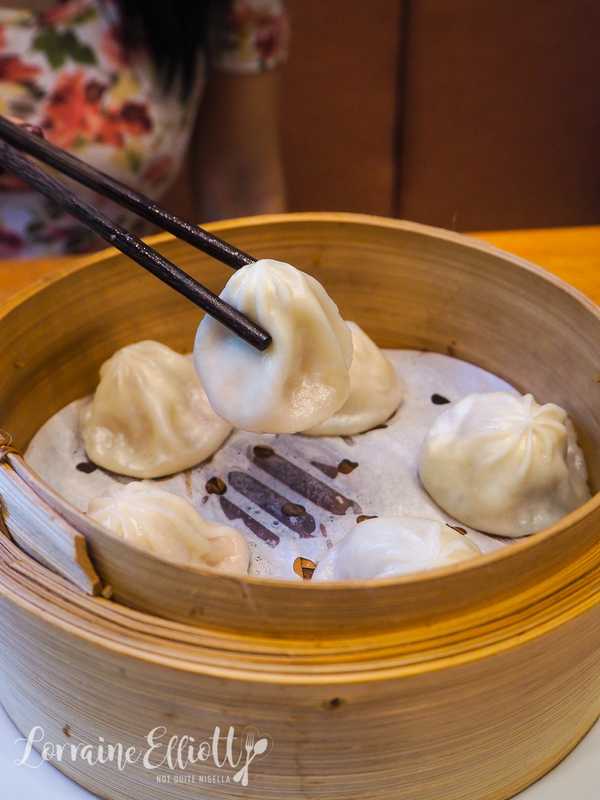 The pot stickers or Guo Tie are thicker and larger than the other dumplings. They're meaty with a crispy pan fried bottom to them. 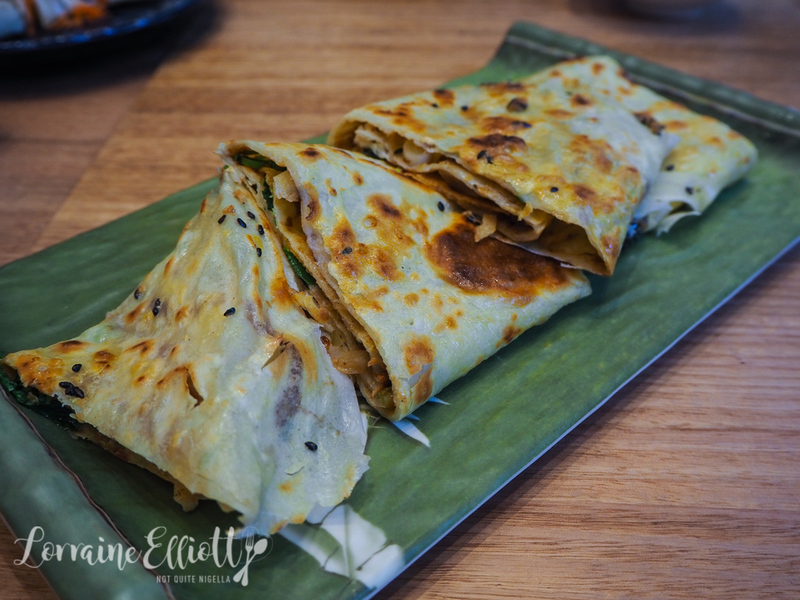 My other favourite item is the signature crispy crepe, another item I ate in Shanghai. I always wonder why this isn't more popular at the street food stalls. It's very cheap to make being simply a flour based pancake filled with spring onion, hoi sin sauce, pickled vegetables and fried won ton wrappers but the flavour and texture is so moreish. This is also a very large serve. The dessert menu online is extensive while the in store menu only has two choices-osmanthus jelly or mango pancake. Given the choice of jelly or mango pancake Mr NQN opts for the jelly because he confesses that he's often disappointed by mango pancakes. 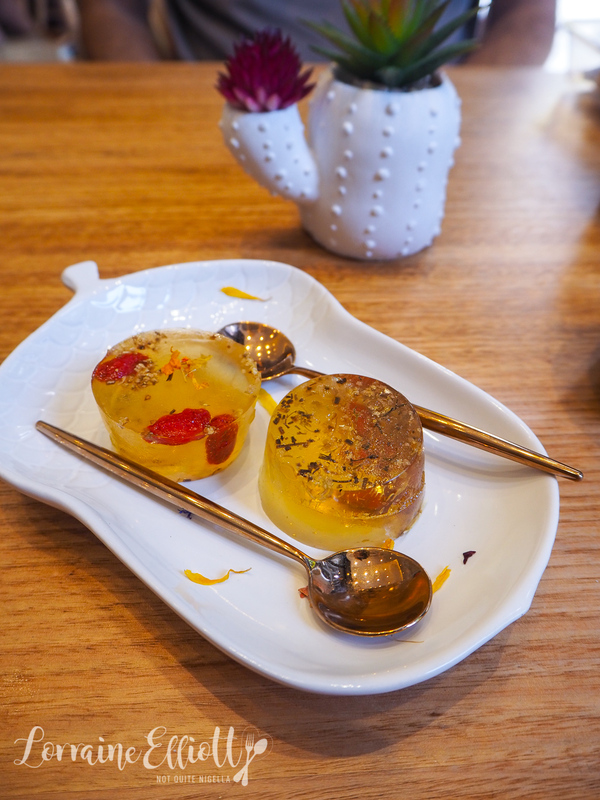 The jelly is firm-very firm indeed but the flavours of the osmanthus flower and goji berry are fruity and pleasant. So tell me Dear Reader, what is your favourite street food to eat? 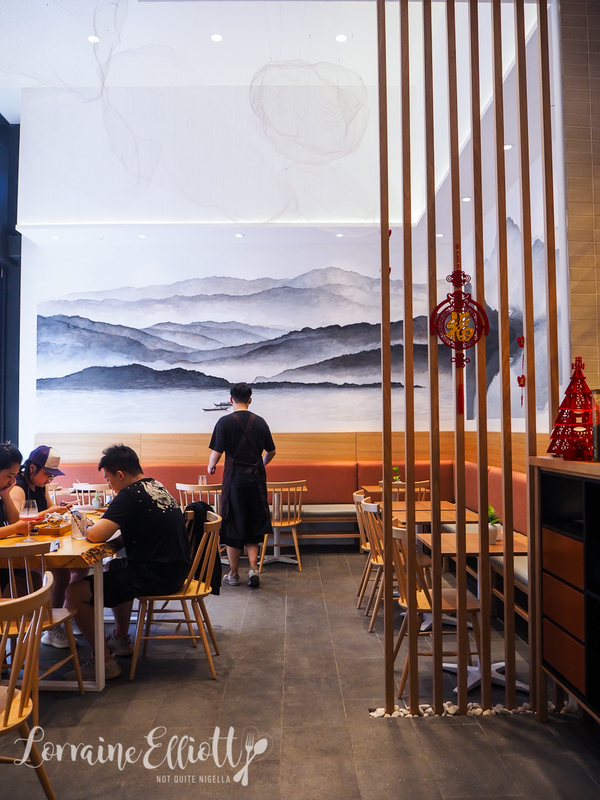 Do you have something that you always like to order at yum cha?